Each tablet contains: Aceclofenac: 100 mg.
Aceclofenac is a new non steroid product of synthesis having an important anti-rheumatic, analgesic, and anti-inflammatory activity. It inhibits the synthesis of prostaglandins, main mediators of inflammatory processes. Treatment of painful processes of different aethiology such as odontalgia, post-traumatic tumefaction, lumbosciatica, myalgia, post-episiotomiae pain, post-labour pain, primary dysmenorrhea, and extra-articular rheumatism. Due to its anti-inflammatory activity it is also indicated in chronic treatment of inflammatory processes such as rheumatoid arthritis, ankylosing spondylitis, osteoarthritis, and scapulohumeral periarthritis. Hypersensitivity to aceclofenac or drugs of the same group (Diclofenac). Patients suffering from gastroduodenal ulcer in active phase. 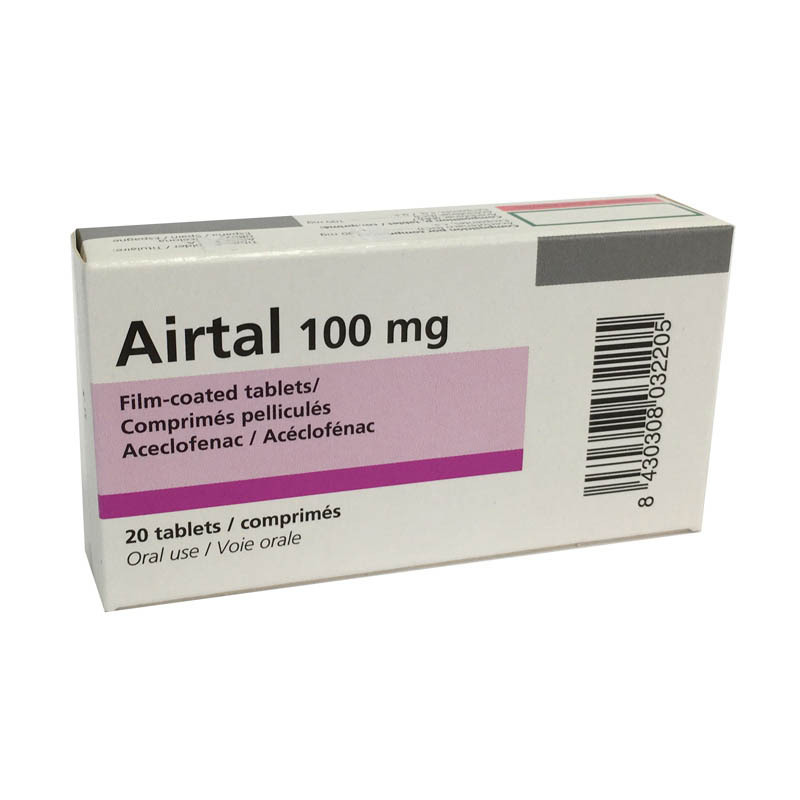 As with other NSAI agents, it is contraindicated in asthmatic patients in which ASA and other inhibitory agents of synthetase prostaglandine cause access of asthma, urticaria or acute rhinitis. Patients suffering from gastrointestinal troubles or with a history of peptic ulcer should be kept under close surveillance. It should be used with special care in aged patients or in patients under treatment with diuretics and/or in convalescent patients after surgical operations, as well as in patients under the effects of a severe hepatic, cardiac or renal lesion. Children: Neither the dosage nor the recommended indications have been established for children under 7 years. Although there are not data concerning the interactions of this drug with others, it is convenient to inform the doctor if the patient is under treatment with other medicaments, especially if they contain lithium or digoxine, anticoagulants, oral antidiabetics, diuretics or under any other anti-pain drug. As a measure of prudence, patients suffering from vertigo or other troubles of CNS will refrain from driving or handling dangerous machinery, and will avoid the situations requiring a special state of alertness. The data having until now are not enough, so it is recommended not to use the drug in case of pregnancy or lactation. The reported side effects have usually been slight and transitory. Epigastric pain, vomiting, nausea, and sensation of fullness have been described. Occasionally, skin rash, oedemas, and rarely, urticaria. Occasionally may arise headache, sensation of tiredness, drowsiness or dizziness, as well as an increase of nocturnal diuresis. Generally, the daily dose is of 2 tablets (200 mg/day) divided into 2 intakes, 1 tablet every 12 hrs. Tablets should be ingested entire, with a few water. Intoxication and treatment: A typical history of overdosage with aceclofenac is unknown. In case of a massive accidental intake, the patient should be treated according to symptoms, giving him medication against gastrointestinal irritation, hypotension, respiratory depression, and convulsions.